CAD software used: Autodesk Inventor 2018. Download Scope: 3D CAD model (Autodesk Inventor files), STEP. An industrial robotic arm with 5 axes, mechanically, the robot is excelled according to the design issue; it depends on synchronous pulleys and belts to generate its movements. Additionally, it uses electrical motors which work using direct current. The motors have low number of (rpm-round per minute), the direction of rotation can be controlled by means of the reverse of feeding polarity. The motors are provided with encoders which have high level of accuracy, and they can give (1024) pulses for each rotation of the motor axis, i.e. one pulse for each (0.35) degree of rotation. 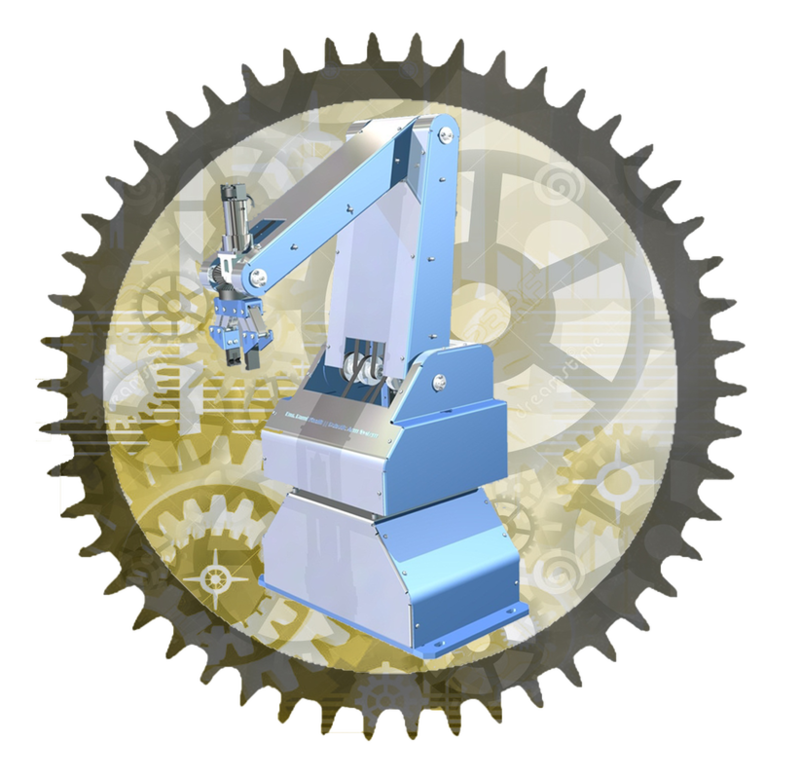 The robot is consist of a rotary base which represents the first axis of the robot and it can rotate with (360) degrees. The arm which connected the base represents the second axis of the robot and it can rotate with only (80) degrees. The arm which connected to the previous arm represents the third axis of the robot and it can rotate with (120) degrees. Regarding the actuator end of the robot, which represented by a mechanical gripper, it represents the both four and five axes, it can rotate around two perpendicular axes, and so it gives the robot two degrees of freedom in addition to the three degrees of freedom resulted from the previous axes , so the robot has five degrees of freedom (DOF). The robot has six direct current motors, on motor for each axis. The sixth motor is used to generate the movement for the gripper's two jaws according to "open" and "close" cases. The gripper mechanism consists of one pair of worm gears driven by one worm, so the worm rotation results the rotation of the two worm gear in opposite directions, the greatest angle which the gripper can open is (60) degrees. The rotation of the Actuator end around two perpendicular axes can be achieved using three bevel gears, two of them are assembled to one axis in opposite direction and the third bevel gear is assembled to other axis. The movement method can be explained as following: when the two opposite bevel gears turn in opposite direction, the third bevel gear turns around its axis, so the gripper turns around its axis. On the other hand, when the two opposite bevel gears turn in the same direction around their axis, the third bevel gear doesn't turn around its axis and turns around the other two gears, and so the gripper turns around the axis of two opposite bevel gears. The space of work diagram for this robot is cleared in one of the above pictures. Post by ‎المهندسون السوريـون The Syrian Engineers‎.